Whether you count Estimated Prophet in 7/4 or 7/8 (I’ve seen it represented as both at various times) it remains a tricky song to play. At least for me it is, but a large part of this is Phil’s inventiveness combined with a complex time signature and it’s difficult to really improvise too much off the main riff. I find myself concentrating on counting too much to be able to throw in any extras. Of course, this is one that I’ve only really tried to play along with the recording. It’d take a seasoned crew to be able to pull this one off well, in my opinion. 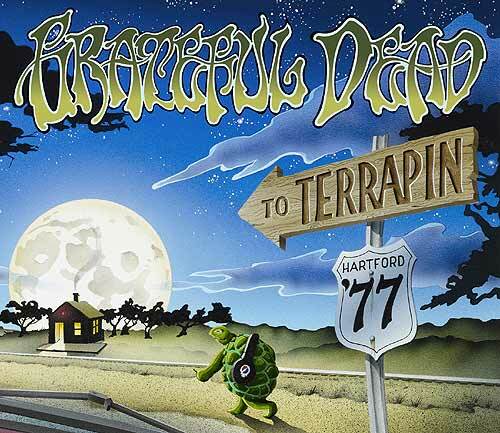 This particular performance was taken from the To Terrapin album, which documents the final night of the fabled May 1977 tour at the Hartford Civic Center in Hartford, CT. There are a lot of stars in this show, but this version of Estimated fit the mood of what I was looking for today. What jumps out at me right away is that Jerry’s tone has a bit more reverb to it and less of the envelope filter ‘thwack’ sound. It sounds like Bobby might have hit a sour chord before the singing kicks in, but it’s a quick recovery if I’m hearing things correctly. Everything else sounds pretty good. The band is tight, the backing vocals don’t raise any red flags. There’s a big hit right after Bobby sings “might and glory gonna be my name” that adds some oomph. I like the rolls that Keith adds to the bridge section of this song too. This version has a solid representation of that. As the band works its way into the solo section, Donna adds some “oohs” that sound very nice. When she could hear herself on stage she generally sounded really good. It’s just a shame that didn’t happen more consistently. Into the instrumental section Keith’s playing is almost reggae-esque. There isn’t a lot of deviation from the basic groove by the foundation players – Bobby, the drummers, and Phil to an extent keep things pretty straight forward and let Jerry do most of the exploration here. Bobby’s playing is both percussive and jangly, not that this is unusual, but more that it’s very noticeable in this recording. Jerry reels it in and after a few “nah nah nah”s the song seems to fade out only to almost slam in to Playing In The Band. The transition is a bit sudden and unexpected, but then again, so were the Grateful Dead. Tagged 1970s, 1977, Hartford CT, May 1977, To Terrapin. Bookmark the permalink. Another great review of a set that seems to be really divided by fans of the band. I absolutely love this release for many reasons. First off, you need to just imagine where the dead were at. Seeing this was the last night of a tour that they had to innately believe was a knockout. They were obviously tired and were focused on going home, but they still brought it. The tiredness seemed to create a much more laid back version of most songs, which I truly love. The tempo is never rushed which creates an almost more sincere effort. Secondly, the sound quality is 2nd to none, in my mind. My first exposure to this concert ( after a really hard work week) was actually the motivation to taking a much closer look at the Dead again. Needless to say, this took my down many paths I had no idea I was heading. About Half the DPs and box sets later, and attending numerous festivals with surviving dead, I still have a very special respect for this concert. I often listen to this show falling asleep and it never disappoints. Despite being tired the dead really give it their all and would highly recommend this release to anyone that even remotely thinks they like the dead. Fell asleep to Sugaree just last night and woke up in a great mood this am. Like the rest of the songs estimated is laid back and gentle, like the entire evening. Love to hear your appreciation of Donna on this one. I really feel she added a lot to the band in 76/77. I like her in all years despite some bad moments, but in those couple years after the hiatus she was just great. Agree fully Mike. I loved Donna’s sound and persona in the band. She was a great hippy chick from that era and had the aura of bringing a sort of balance to the boy band the seemed to need one. When ever I hear a song that she had even a small fill in vocal without her I feel a void. Kinda like eating a brownie without nuts. The entire time eating one, my senses are expecting that crunch and flavor burst. This new-at-the-time song benefited on this tour from its many outings and its utter freshness. The band was far from California, the destination of the song’s tweaked subject. So they were singing to one or many potential cultists at this east coast show. Maybe they thought of it as a warning. In any case, it sounds fairly mild here. Keith is playing a nice organ and Jerry certainly has his Mu-Tron pushed. The verses slide by and the interlude to the jam is cool with its “Oooh”s from Donna. As prescribed, Jer takes over on the wanky part and this time he eases in. Soon enough he is producing fruit from the vine. Call the time signature what you want, the figures repeat every 14 beats. Everyone grooves mightily and effortlessly here. The real treat may be the content (song selection) of this jam as a whole. Let’s see. With the help of Bobby’s audible count, the tides shifts suddenly but smoothly to the normal 10-beat intro to “Playing in the Band”. Mike, I agree with you – Donna added a lot, especially post hiatus. It’s a shame that during the band’s peak (or at least one of them) from 72-74 coincided with her not being able to hear herself on stage, one of several factors that lead to pitch problem she says. Music Never Stops and Cassidy immediately jump out as songs that were better WITH Donna.